Over 600,000 people could be affected by the floods after the heaviest rains the region has witnessed in over a hundred years. IRELAND WILL DISPATCH tents, blankets and other vital supplies to assist flood victims in the Balkans. The airlift which is worth €220,000 is further to the €50,000 in funding to World Vision Ireland announced last week to support flood relief in Bosnia and Herzegovina. 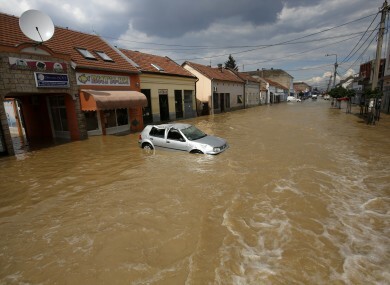 The death toll from the Balkan region’s worst rainfall in over a hundred years has reached 57. The supplies are being sent from the UN Humanitarian Response Depot in Brindisi, Italy, where Irish Aid pre-positions supplies for use in global emergencies. The Prime Minister of Serbia, Aleksandar Vucic said “the situation is catastrophic”. Minister for Trade and Development, Joe Costello said “We continue to be concerned about the impact of the floods on people across the Balkan region. Thousands of homes remain without water and electric power with many only accessible by boat. The World Food Programme has reported that some 600,000 people could ultimately be affected by the floods following the heaviest rains the region has witnessed in over a hundred years. Irish Aid maintains emergency stocks within the UN Humanitarian Response Depot network located in or close to crisis prone parts of the world. Through this network Irish Aid prepositions emergency stocks in Dubai, Ghana, Italy, Malaysia and Panama. The EU is providing significant assistance to the worst-hit communities in both Serbia and Bosnia Herzegovina through the EU Civil Protection Mechanism. The EU has channelled humanitarian aid and equipment as well as EU Civil Protection teams, humanitarian experts and over 660 relief workers to assist flood victims. Email “Ireland to send supplies including tents and blankets to flood victims in the Balkans”. Feedback on “Ireland to send supplies including tents and blankets to flood victims in the Balkans”.